Looking for some help on something that doesn't appear to make sense here in relation to neckpoints. H1-A1 is the guideline for the front shoulder. 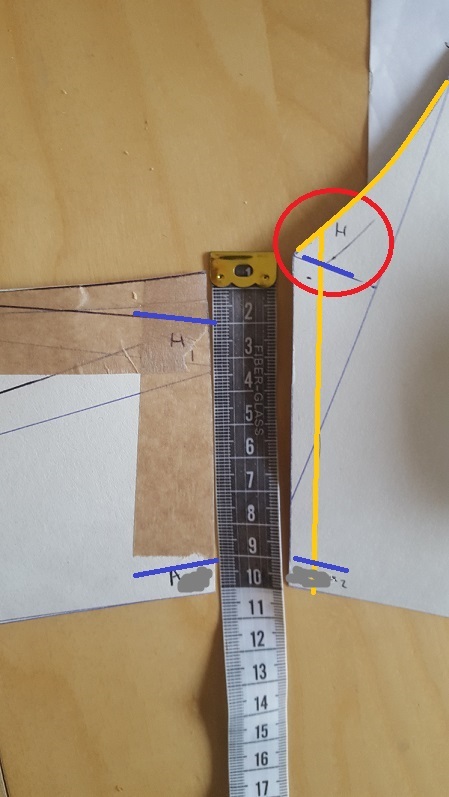 A2 is found by taking 1cm off the length of the back shoulder and applying across from H1 (so far so good) but then one adds on 1.5cm for h1 ('Stehkragen') which makes the front shoulder wider than the back. I had always understood that the reverse was the case. Is the draft incorrect or have I missed something? Go 0.75cm back for the seams and then compare the lengths again. Thanks - I have realised I made an error in drafting H1-e-f - now that's corrected everything looks much more sensible.! The back of a waistcoat is a little bit bit longer then normal because this way it can slip under the shirtcollar. Thanks. Trying a toile on there seems to be a subtantial excess of length in the back (c.3 cm) - pinned out it fits pretty well. 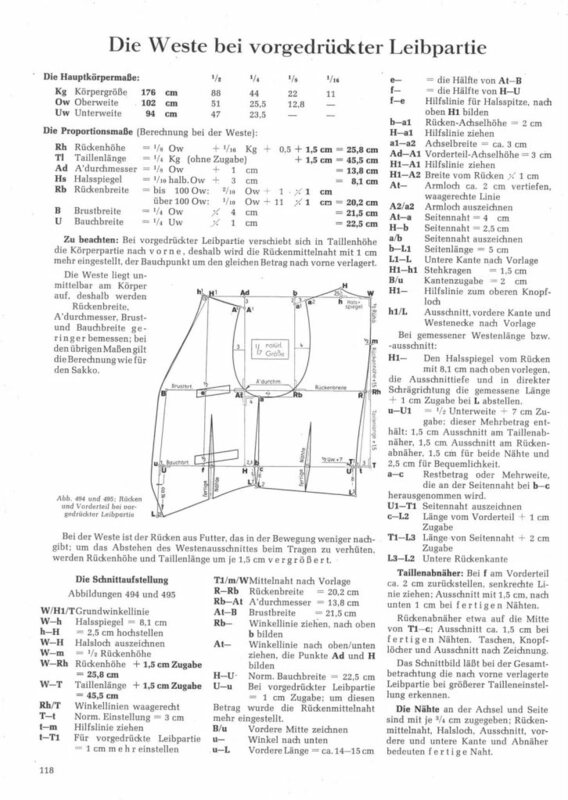 The 1,5cm is for the band collar (=Stehkragen). There you will add a strip of front cloth across the back neckhole wich is´nt mentioned in the draft. The 1,5cm are not for the shoulder, it´s for the collar. The back shoulder is attached starting at H1. Todays waistcoats usually don´t have this collar band anymore, so you could skip the 1,5cm. Peterle - does that mean one would reduce the back neck commensurately (1.5cm) - if not and I take you on face value then H1 (front) and H go together and A2/a2 - then there's a huge amount to full-in. A couple of pics re. one final question - where should I move the darts in the back scyes? Without them they're really baggy. The back looks a little messy at present as it seems to need narrowing across the top (hence being pinned out). If anyone has any tips as to how to deal with the slight gaping at the front too I'd be really grateful. Your patter is vintage. 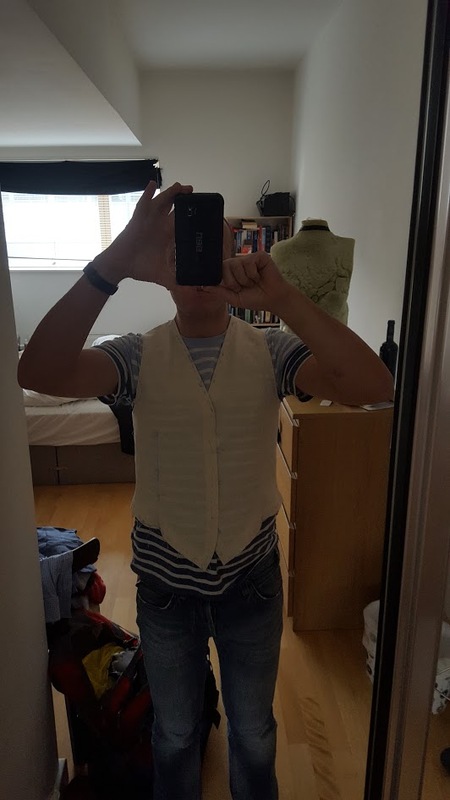 Back then Waistcoat had a band collar of upper fabric that run across the back neck and covered a bit of the shirt collar. The strip had a finished width of about 1,5cm. This strip is never mentioned in the Rundshcau patterns, probably because it was coonsidered as a well known fact. But the pattern mentions the transition area between the front edge and this band collar, wich is the 1,5cm from H1 to h1. So H1 and H go together and A2 and a2 go together. The back shoulder will be 1cm longer than the front, wich you have to ease in. This 1cm is a kind of dart for the shoulder blades. (When you have a back shoulder that is longer then the front your armhole will gape like in your toile). When you don´t want a back collar stand just skip the 1,5cm from H1 to h1 and let the front edge end in H1. 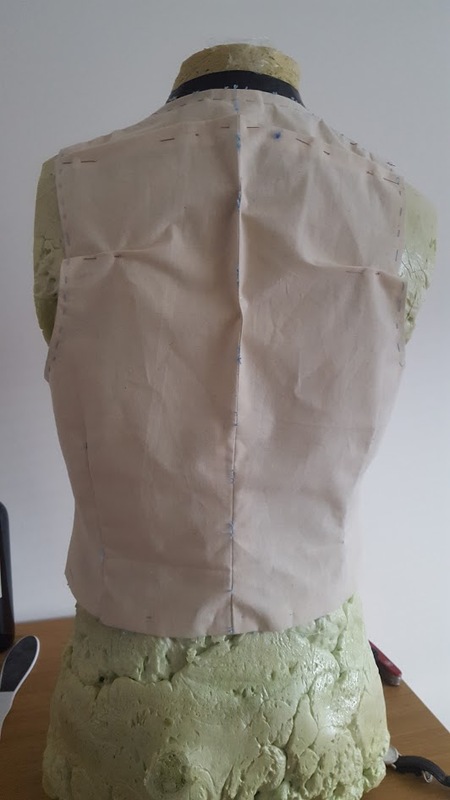 When you want to add the band collar( wich I consider the "Taylor´s choice") you have to attach a strip of cloth as a back collar. it´s finished width is 1,5cm, it´s finished Length is the same as W to H.
There are some threads about this waistcoat detail, so have a look. Edited by lngn2, 02 November 2017 - 12:35 AM. That said, even then one appears to have more than 1cm ease as the shoulder seam has 0.75cm seam allowance. Unless there's a 'step' ? Hopefully my image below explains what I mean? 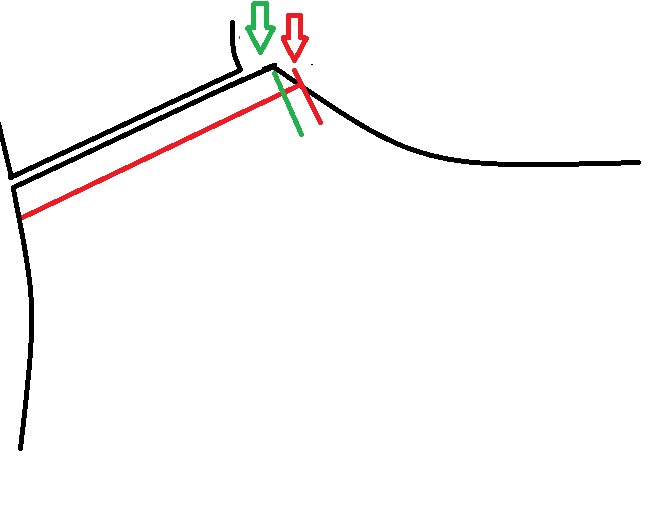 (Green is front with 1cm less than back, red is 1cm plus extra resulting from moving down 0.75cm on back shoulder). And thank you for the help on this - I am most grateful! Did you add the Sewing allowance to the back neck line in the paper pattern? The back neck line is netto in the draft. H1-A2 is 2cm shorter than H-a2. That´s wrong. It should be 1cm. So lengthen the front shoulder seam for 1cm at the armhole. Edited by peterle, 02 November 2017 - 01:04 AM. BTW, I see you have´made a body double for fitting. That´s very good. For fitting the dummy should wear the same garments underneath, you want to wear in the end. Perfect - thank you - I'll make the necessary changes later then!